Escape the hustle and bustle of the beaches and markets to discover a Bahamian landmark, The Queen’s Staircase. 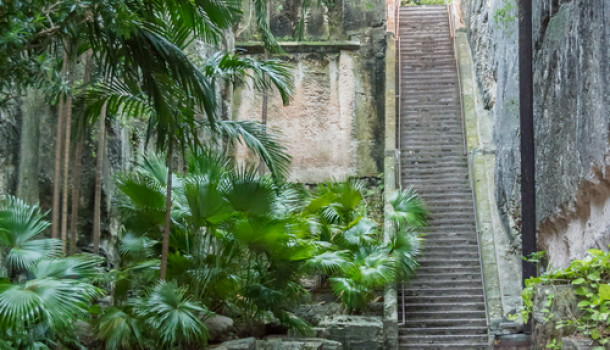 Nestled among lush, tropical greenery, you can visit and climb the 65 steps, which were carved out of solid limestone by slaves in 1793. The Queen’s Staircase was named after Queen Victoria to honor her 65-year reign over the Bahamas as well as her part in abolishing slavery in the country. The cultural and historical significance of the site has made it one of Nassau’s most popular attractions to see and is an important experience for visitors who want to learn more about the unique and interesting history of this great country. The staircase is open daily and can be accessed from the top by visiting Bennet’s Hill and Fort Fincastle. The attraction is free, but keep in mind that the stairs can become slick after rain and proper footwear should be worn at any time due to the steepness of the incline. Immerse yourself in another world as you and your family explore the Creative Nassau Market. Designated by the United Nations Educational, Scientific and Cultural Organization in 2014, Creative Nassau has proved to be one of the most lively and interesting ways to enjoy the Bahamas for all of its local flair. 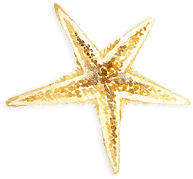 Visitors will enjoy live music and a massive selection of truly Bahamian wares for purchase, including jewelry, art like ceramics and paintings, gifts for your favorite furry friend, and straw items. These handmade goods will be cherished for years to come after your visit to Comfort Suites Paradise Island. 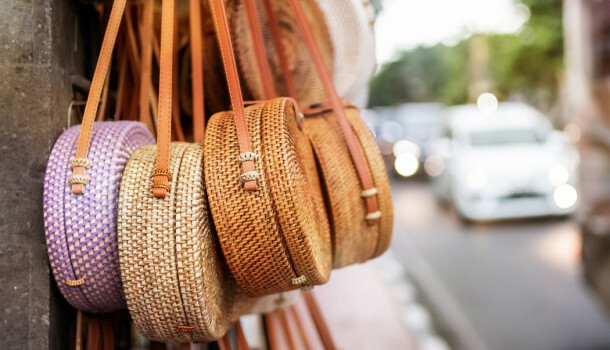 The Creative Nassau Market is held bi-weekly, Wednesdays and Fridays, throughout March on the 1st, 6th, 8th, and 13th, from 9:00 a.m. to 5:00 p.m. You and your family will have plenty of chances, no matter when you schedule your stay. Come on down and see what the Bahamas has to offer – and grab a fruit popsicle while you browse too! Let your heart float away as you enjoy an evening of live music, hors d’oeuvres, dinner, cocktails, and more at the Jazz in the Park: A Night of Love event on February 10th. The incredible Cherelle & Jazz Etcetera will be offering up soothing sounds as you spend time with your loved one at the beautiful Clifton Heritage National Park. A cultural show performed by Action Limbo King and live art and auction by Jamal Cyril will also be available for attendees to enjoy. General Admission, VIP, and Platinum tickets are available, ranging in price from $50 to $150 with special access to parts of the event available as well as food and drink specials. Cocktail Hour begins at 5:00 p.m. and the show begins at 6:00 p.m. Be sure to call ahead to reserve your spot or purchase tickets online to enjoy a wonderful and romantic evening in the Bahamas. A taste of history is just a shuttle trip away on your next visit to Comfort Suites Paradise Island. 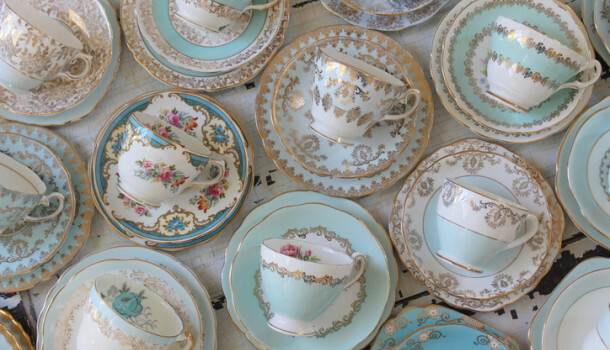 On the last Friday of each month, the Bahamas Ministry of Tourism holds a special, complimentary tea party for all visitors to the Government House. Guests will enjoy incredible live music and a fabulous fashion show put on by Bahamian designers, all while enjoying a fine sampling of local teas, sandwiches, and pastries from the area. This unique event is hosted by a diverse group of important Bahamian women and allows all visitors, adults, and children, of beautiful Paradise Island the chance to enjoy the local culture. Courtesy shuttles are available from the hotel so don’t miss your next chance to experience the Bahamas in a new way on January 25th, from 3:00 p.m. to 4:00 p.m. For more information, contact the Ministry of Tourism, People-to-People Unit at (242) 397-2768 or (242) 397-2444. Football fans can have it all as paradise combines with excitement on the gridiron during the Makers Wanted Bahamas Bowl. On December 21st at 12:30 p.m., the Florida International University Panthers will square off against the University of Toledo Rockets at the Thomas A. Robinson National Stadium to determine who will go home with a bowl game win for Christmas. Tailgate with fellow fans and make your stay at the Comfort Suites Paradise Island all the more amazing. Live entertainment and performances, camaraderie, and of course, incredible shows of the best up-and-coming athletes in college football await you at the Bahamas Bowl. For family-oriented dining fit for every budget and palate, visit the delightful location at Comfort Suites Paradise Island – Crusoe’s Restaurant. Guests will enjoy the diverse menu, which features plenty of big Bahamian flavors as well as comfort food favorites from around the world. Tickle your taste buds with Down Home Conchy Conch Fritters and spicy calypso sauce, enjoy juicy turkey, veggie, and Angus beef burgers, and don’t forget to try the fresh, local seafood! There’s something for everyone among the array of artfully spiced appetizers and entrees. And of course, no meal would be complete without a decadent dessert. Try the Guava Brioche Bread Pudding topped with vanilla ice cream or the divine English truffles with their chocolate ganache, cherry filling, and brownie layers. Reservations can be made or visitors can come by for lunch from 12:00 p.m. to 4:30 p.m. or dinner from 5:30 p.m. to 9:00 p.m. Grab the kids and get on out there! True Bahamian culture is just waiting to be explored on your next visit to Comfort Suites Paradise Island. Check out the traditional Changing of the Guard every other Friday from 11:00 a.m. to 11:30 a.m. You will observe impressive marching displays from the police force headquarters on East Street to the Government House as a new guard replaces an old guard, allowing them to return to police headquarters. The world famous Royal Bahamas Police Force Marching Band plays along with grand enthusiasm during this ceremony, which has been performed in honor of Queen Elizabeth II since 1958. Upcoming dates in October include the 12th and the 26th and recurs every other Friday throughout the year. There is no charge to witness this little slice of Bahamas culture, history, and tradition so enrich your stay by checking it out on your visit. You and your family will encounter animals abound at Ardastra Gardens, Zoo and Conservation Centre. With up-close feedings and plenty of amazing photograph opportunities, families can enjoy a truly immersive zoo experience during their visit. There are lush gardens and winding paths to explore where every nature lover will find themselves at home discovering beautiful, indigenous flowers and trees along their walk. The Ardastra Gardens, Zoo and Conservation Centre offers up the perfect balance of true Paradise Island relaxation beneath shady canopies and among the gorgeous landscape as well as the thrills of seeing incredible wildlife, like the huge Bahamian Boa Constrictor and the colorful Bahama Parrot. Don’t forget to catch the ever-popular, world-famous marching flamingos, three times daily, too! This affordable escape to the wild is open from 9 a.m. to 5 p.m. and children age 3 and under get in free.